Agriculture came to the delta in 1868 when two brothers, Thomas and William Ladner, pre-empted and began to cultivate land at what is now part of Ladner town centre. Significant time, effort, and capital have been invested in improving soils for agricultural production since the pioneers discovered the fertile Fraser River delta. Whole regions were diked, ditched, and drained. Land was cleared, rocks were picked, soil was ploughed, and produce was grown. By the late 1800’s, Ladner was developing into a hotbed of agriculture and related industries. It serviced markets throughout the lower mainland and transported products by roadways, railway, and steamer by the early 1900’s. In fact, some produce from the eastern Fraser Valley was shipped to Vancouver and Victoria through Ladner. From the early years on, support industries and processing facilities developed and expanded with the very productive farms of the delta. Horse drawn wagons haul oats out of the field. The diversity of products grown in the delta has generally increased over the years. Hay production and pastures were very important during the early years. They supported livestock needed to work the land, were instrumental in dairy and beef production, and supported livestock used in forestry operations. Barges routinely left Westham Island loaded with horses and other beasts of burden destined for remote logging camps along the lower coast of BC. Well in excess of half of the farmland was in grass production, and the large barns, more numerous in earlier years, were necessary to store harvested hay. Forage production continued to be a mainstay well into the middle of the 1900’s. Although steam and gas powered equipment had been working the land for some time, the increase in dairy operations continued to be supported by hay and pasture production. In the late 1950’s and early 1960’s there was a fundamental change in the way farms were managed in Delta. The construction of the Deas Island Tunnel opened the land to easy access from neighbouring communities. In addition, expansion of specialty crops, advances in farming technology, and the expropriation of a significant area of farmland caused a shift in farm management practices. Some farms began to move from mixed farming to solely vegetable production or dairy operations. Suddenly, many farmers were farming land under lease with little reassurance of long term farming prospects. The incentives to continue with investing in soil improvements were removed, and farmers had to alter their practices to ensure their own financial survival. A hay wagon brings feed to the barn for storage. By the late 1980’s, 2/3 of the farmland in Delta was farmed under lease, less than 10% of the land was under forage production, and local processing facilities were on the decline as was soil productivity. Farmers had been adapting their farming operations at every point in history to maintain viable industries supported through agriculture. Today, high input costs, changing markets, pressures from competing global suppliers, further reductions in local processing facilities, pests, and problems with soil degradation continue to put selective pressures on farming operations. As a result, the general composition of farming operations continues to change. More and more land is being converted to “newer” crop types such as greenhouse-grown produce, cranberries, and blueberries to name a few. This increase or change in the diversity of crops in Delta is essential for the survival of farming operations working here. 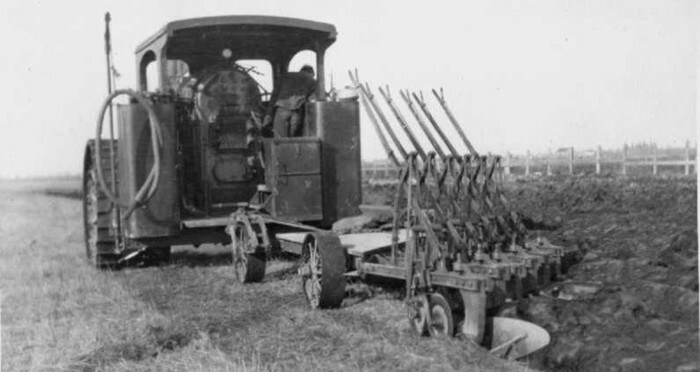 An Avery steam tractor pulls a plough through the rich soil of the lower Fraser River delta.